Tweetable is a WordPress Plugin intended to help integrate Twitter into your blog. It can tweet your blog posts as they are published, shortening the URLs with either Tr.im or Is.gd and optionally including Google Analytics campaign tags. You can display your latest tweet(s) in your blog sidebar with a customizable widget, which can even display your follower count. Tweetable adds functions that turn the WordPress admin into a twitter client. The Tweet screen lets you update your status and browse your friends’. The Track page let’s you save keywords to be searched so you can keep an eye on what Twitter as a whole is saying about a given topic. You can set the minimum user level required to access the menus if you would like to allow other authors access. An optional dashboard widget is available, so you can post quick tweets while managing other tasks. 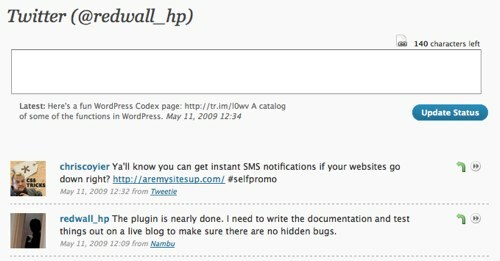 Note: Tweetable requires WordPress 2.7 or later and PHP 5 and up to function. FTP the entire “tweetable” directory to your plugins folder (/wp-content/plugins/). Activate the plugin on the “Plugins” tab of the administration panel. Choose an option from the Twitter menu in the left-side admin navigation to run the setup wizard and connect your Twitter account to the blog. Like this plugin? Donate $10.